Set of 8 Plaque Embossing Plunger Cutters by PME. The Plain Plaque plunger cutters measure 3 1/2" x 2", 3 1/4" x 2", 2 3/4" x 1 3/4", and 2 1/2" x 1 1/2". The 2 "Rose Spray" cutter Plaques measure 3 1/2" x 2" and 2 3/4" x 1 3/4". 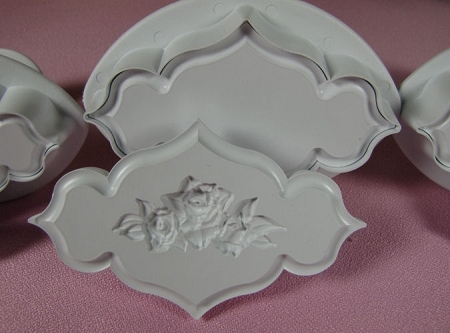 The 2 single rose cutter Plaques measure 3 1/4" x 2" and 2 1/2" x 1 1/2". The plungers can act as cutters or plungers. They are dual purpose and they are also interchangeable. Instructions included.